1. How do I designate my skill as a kid skill? To be an eligible participant in the Alexa Skills Challenge: Kids, you must designate your skill as one intended for children under the age of 13. Instructions for doing this are provided below based on two different ways to build Alexa skills. Designate your Alexa skill as one intended for kids in two areas within the Amazon Developer Console. First, on the Publishing Information page, select Kids from the Category drop-down list. 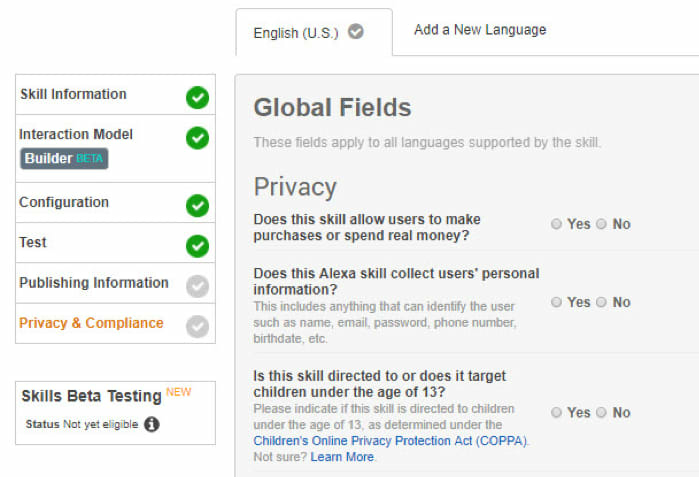 This will make your skill more discoverable to customers searching for kid skills in the Alexa Skills Store. Second, on the Privacy & Compliance page, answer the question “Is this skill directed to or does it target children under the age of 13?” with Yes. This will permit you to distribute the child-directed skill, and enable customers to provide consent for their children to use child-directed experiences. 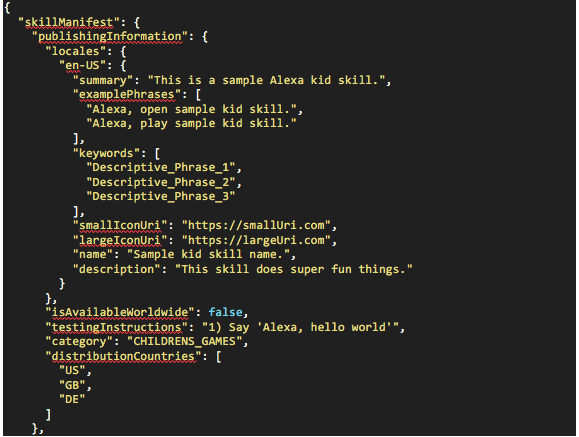 Similarly, to designate your Alexa skill as one intended for kids when using the Skill Management API, two things are required in the skill manifest (skill.json file). 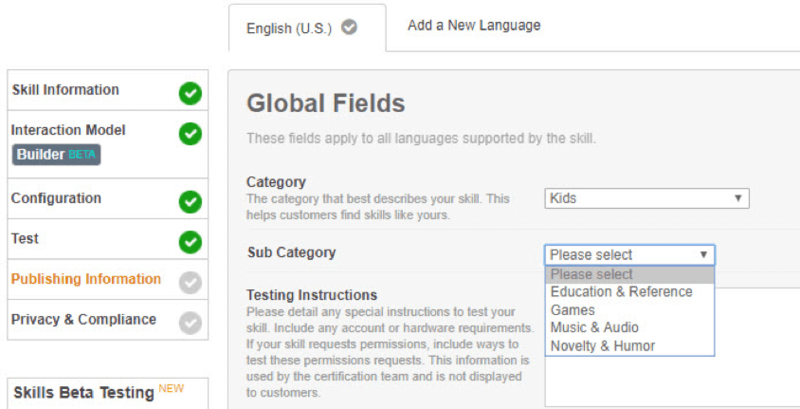 First, skillManifest.publishingInformation.category needs to be set to one of the following to make your skill more discoverable to customers searching for kid skills in the Alexa Skills Store. Learn more about skill category enumeration. Learn more about the privacyAndCompliance object. 2. May I enter more than one skill into the Alexa Skills Challenge? Yes. After you’ve submitted your entry, the button will change from Enter a Submission to Manage your submission. Click on that button and you’ll have the option to either edit the submission you already entered, or enter additional submissions. 3. May I participate in the Alexa Skills Challenge if I don’t live in the US? The Challenge is open to: (1) individuals, teams, and organizations—from any country—in which all members are legal adults (the age of majority varies by country), as well as (2) individuals and teams in the US and Canada who are age 13-17 years, complete a consent form, and have a parent or guardian submit their skill on their behalf. See exclusions in section 3B of the competition rules. 4. Alexa currently only supports kid skills in the United States. Do I need to have a US Amazon Account to develop my kid skill? No. You only need to publish your skill for the US, and in English. Learn more about distributing your skill to select countries & regions. 5. I’m a developer from a country in which Alexa is not available yet. How can I test my skill? You can use https://echosim.io/, a community-built, web-based tool to test your skill as well as try skills that are already live in the Alexa Skills Store. 6. Is the Alexa Skills Challenge only open to new skills? The Challenge was announced on October 25, 2017 and is open to both newly created and existing kid skills. However, if you’re entering an existing skill, you will be required to explain how it’s been updated during the Challenge’s Submission Period (October 25 to January 10). If your existing kid skill has already won another contest, it will not be eligible for prizes in this Challenge. See section 4B(iii) of the competition rules. 7. Should the skill be geared toward younger or older children? You can build a skill for any age range you choose. A kid skill is defined as one that intended for children under the age of 13. Testing your skill with multiple children in different age groups can provide learnings to help you determine your ideal age range. 8. I’ve started my contest submission on AlexaKidSkills.Devpost.com but I’m not finished. Will it save what I have if I close my browser? You may submit your skill to save your entry, and continue updating it until the deadline on January 10, 2018 5:00 PM Eastern Time USA. 9. When I designate my skill as child-directed, it requires verified parental consent. How does that work? The first time a customer asks Alexa to enable a kid skill, Alexa will ask a parent to give permission by following the steps in their Alexa app. The Alexa app will ask the parent to verify themselves using a one-time SMS code sent to the mobile phone number in their Amazon account, or by entering the security code of the credit card in their Amazon account. Parental consent will be saved, so access to kid skills will not require this verification again. After consent has been granted, customers will not be asked for consent each time they initiate a kid skill. 10. Can a kid skill ask for the child’s name, nickname, age, class, location, or other information? We do not permit kid skills that collect personal information (as defined by the Children’s Online Privacy Protection Rule, or COPPA) from customers. For information on what constitutes personal information under COPPA, please refer to the FTC’s Frequently Asked Questions on complying with COPPA, FAQ A.3. 11. How can my skill track an individual’s progress without creating an account and asking for personal information? You can set up an anonymous user ID using the userID session object. 12. Can a kid skill involve adults along with kids? Yes! Skills can engage one individual or many. We encourage skills that bring the family together. 13. Can I get access to the kid’s or parent’s voice recordings? No, we do not share audio recordings with developers. We only provide text-based intents and slot values. 14. Can I make Alexa better understand a young child who may not speak clearly just yet? 15. Do you have rules that reinforce “please” and “thank you” in kid skills? We do not enforce rules related to politeness. But if you say “Alexa, thank you,” Alexa provides a variety of responses. 16. Do you recommend making leveling up or down explicit to kids, or handling it behind the scenes based on streaks of right or wrong answers? You may want to experiment with having kids level-up only by answering questions correctly, or by allowing them to level themselves up simply because they want to explore what the super-advanced, double black diamond level is like, even if it’s beyond their current capabilities. 17. Can Alexa do math? Can Alexa help others do math? She sure can. Try saying, “Alexa, how much is 5 times 367?” There are many ways to design a skill to educate. One way is to create a quiz game that prompts the child, “What is 5 + 3?” The slot would provide the answer, 8. The special sauce would be in how you’d make a math quiz engaging. Here are some helpful tutorials with sample code for quiz, trivia, decision tree, and interactive adventure game skills. 18. Can Alexa ask a question in one language and get an answer in another to help kids learn a new language? Yes. If the child speaks English, for example, you could record the question in say, German, and use the audio SSML tag to embed pre-recorded audio. 19. Would you recommend advising older kids to use a paper and pencil to work on harder questions? Sure. Alexa waits eight seconds before prompting the user for a response. You may want to use memory to save their spot in the skill so they can return to it later. You can use Amazon DynamoDB to persist session attributes for future use. 20. Can my skill have multiple invocation names? Can I change the invocation name? Skills may not have multiple invocation names. Once you’ve published your skill with an invocation name, you’ll need to contact us if you want to change it. Changing your skill’s name may create a confusing experience for customers who have already started using your skill, so it is not recommended. See tips for choosing an invocation name, and search the Alexa Skills Store to see if your idea is already in use. 21. How can I build a skill for Echo Show? Check out the build skills for Echo Show documentation, as well as these helpful blogs: build skills for Echo Show, how to teach an Alexa skill to detect a screen, choose the right template for your visuals, display interface skill for Echo Show tutorial as well as certifying your skill for Echo Show. 22. Can I build a skill that works for Echo Show, but not for voice-only Echo devices? We believe skills should be designed voice-first. Screens may complement the experience, but should not dominate the conversation. Echo Show represents a tremendous opportunity to build engaging experiences. But ideally, skills should work on any Alexa-enabled device. 23. How can I get Alexa to add emotion when she speaks? Speech synthesis markup language (SSML) tags can add natural expression and personality to your skill. Using SSML tags, you can have Alexa take a pause; make her speech louder or softer, faster or slower; pronounce words like “pecan” in different ways, and more. You can also use SSML to have Alexa pronounce special words and phrases, known as speechcons, more expressively, such as wahoo! or dynomite! Learn more about SSML and speechcons available in the US, the UK, Germany, India, and Japan. 24. Can I use different voices? Yes, you can use AWS Polly to convert text to lifelike speech in more than 50 different voices in more than 20 languages. Or, you can use recordings of professional voice actors or record your own voice. Learn how to use the SSML audio tag to incorporate audio files. You can also use SSML tags to adjust Alexa’s voice to be higher pitched, slower, louder, and more. 25. Can I add music clips and samples from Amazon Music? Can I add my own audio mp3? No, you may not use music from Amazon Music or another music service provider in your skill. You can add your own audio using the SSML audio tag as long as you own the intellectual property. 26. Can I use printable maps or other props available on the web that go along with the skill? Sure! You can even have the website update as the user moves through your skill. Learn how with this AWS IoT tutorial. 27. How do I publish my skill? Once you’ve finished developing and testing your skill, you may deploy your skill for beta testing to a specified group of users, or you can submit your skill for certification for publication. After Amazon has reviewed your skill, you’ll be notified if your skill has issues that need to be corrected. If your skill has been certified, you will be provided with an estimate for when it will be published and available to customers. After your skill has been published, if you decide to change the interaction model, you will need to recertify your skill. 28. Is there an API to update utterances, intents, and slots? Yes. Learn more about the Alexa Skills Kit Command-Line Interface (CLI) and Alexa Skills Management API (SMAPI). 29. How can I get data to improve my skill? You may get insights about your Alexa skill using the metrics dashboard, as well as by reading the customer reviews for your skill in the Alexa Skills Store.